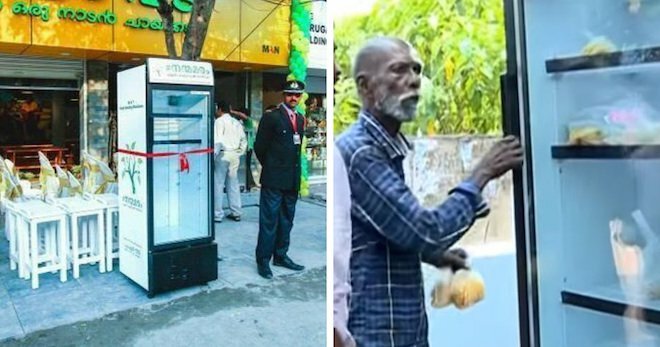 Home » Amazing & People » Restaurant Puts Fridge On Street. Now See What This Homeless Man Ended Up Doing. OMG! It’s no secret that restaurants regularly throw away a lot of food.But when one restaurant owner in Kochi, India, noticed a homeless woman eating from a garbage bin, she knew she wanted to do something. That’s when Minu Pauline, who runs a restaurant called Pappadavada, had a brilliant idea. She decided to set up a fridge outside of her restaurant where she could put her leftover food and let homeless and hungry people help themselves. Pauline leaves around 75 to 80 portions of food every day and her patrons also regularly put their leftovers inside the fridge.